When Eric reached a stage in his apprenticeship where "case" products were his specialty, he began the task of turning his house into a home by taking advantage of his skills as a furniture maker by installing an array of custom pieces including an oak fireplace surround, a home theater, a fully functional walnut bar unit, a customized quarter sawn oak commercial kitchen. Spanning the last three years, these projects have kept them both busy. 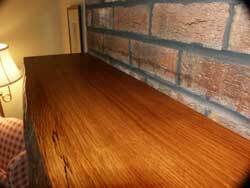 Eric plans to continue his efforts to complete a cherry finished birch office next. 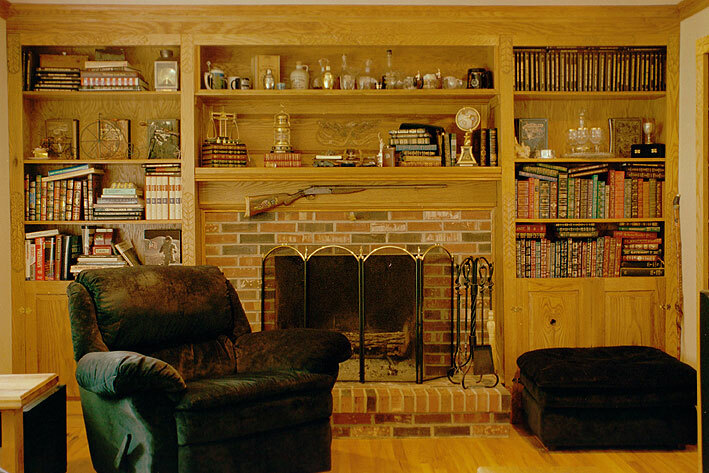 This oak fireplace surround includes two full size bookcase units with solid oak raised panel doors, and a single connecting unit above the mantle. 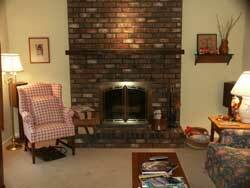 A solid two-inch thick mantle tops the brick fireplace. 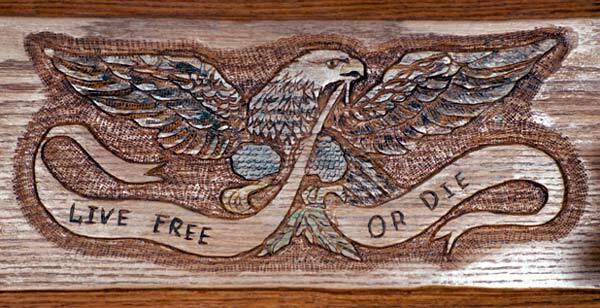 Carving accents include a traditional Bi-centennial eagle flying a banner saluting New Hampshire's "Live Free or Die" slogan. 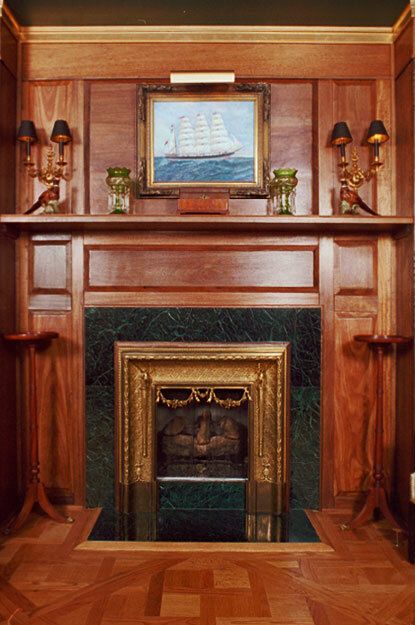 This accent is located in a panel above the mantle, and detailed using a wood burning tool and an acrylic wash for coloring. 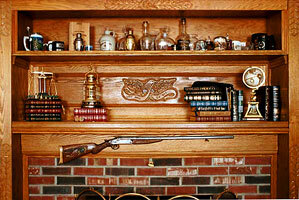 The unit houses his collection of leather bound books, and various "shiny brass objects," as he refers to them. 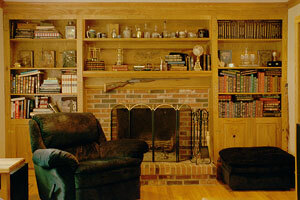 Also featured below right, is a solid mahogany surround also shown in our library portfolio. Surrounds can be made from any hardwood and range from simple case units to hand carved pieces with lion's head mantle supports. This solid quarter sawn white oak mantle shows a live edge and ruff cut ends. 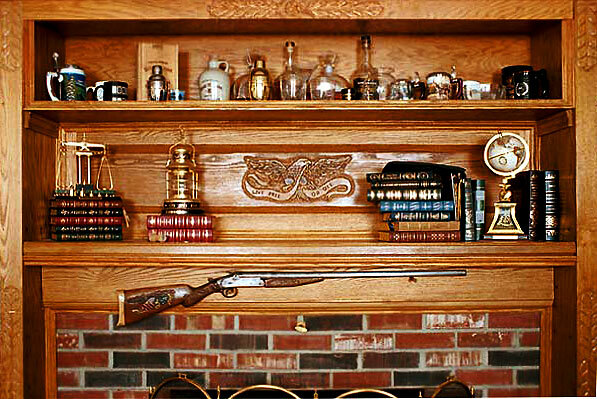 A simple, solid addition to any fireplace.